The Russian Revolution took place 100 years ago and, like the Soviet Union, is mostly forgotten. A handful of names and words ring out from yesteryear—Lenin, Trotsky, Stalin, gulag, Cold War—echoes of a now lost world. Paul Le Blanc’s October Song reminds readers just how difficult it is to make a revolution, especially one that failed. The revolution has been the subject of numerous important studies, including Leon Trotsky’s History of the Russian Revolution, E. H. Carr’s The Bolshevik Revolution 1917–1923, Victor Serge’s Year One of the Russian Revolution, Alexandra Kollontai’s The Autobiography of a Sexually Emancipated Communist Woman and, of course, John Reed’s Ten Days That Shook the World. Each offers insight into a complex historical moment. Le Blanc’s adds to this literature through an analysis framed by the two key words in the book’s title, “triumph” and “tragedy.” His book is an exhaustively researched account of the remarkable pendulum swing that defined the revolution during the pre-Stalinist era, from hope to tyranny. At the heart of his study are a set of compelling questions: How did a revolution come to take place in a premodern, feudal country as the modern, 20th-century took shape around it? How did the radical political parties and popular social movements gain momentum? Why were they not suppressed by those then in power? How did the broad population—including activists and the general public, urban and rural, men and women—legitimize revolution? And most importantly, why did the revolution fail? Le Blanc’s key analytic concept is the soviet, a notion best understood as “council.” They were socio-political organizations that functioned at the local (e.g., Petrograd, Moscow) or sectoral (e.g., factory workers, peasants, soldiers) levels and provided a base by which the czarist power of feudalism could be challenged. Before WWI, many of the progressive bourgeoisie and socialists envisioned a revolution being fulfilled in a parliamentary-style democracy like that in Germany. As the author shows, the revolution’s trajectory goal was redefined as history changed social conditions. Initially a feudal régime was to be superseded by traditional bourgeois capitalism. However, faced with war, political collapse and popular upheaval, Russia ended up a failed socialism. The original goal of a union of soviets turned into a dictatorship of a tyrant. The author draws a complex picture of Russia during the tumultuous World War I era, from 1917 to 1924. It was then a pretty bleak country governed by a reactionary feudal system headed by an incompetent czar, corrupt politicians and backwards-looking landed gentry. Capitalist modernization was slowly introducing new forms of production and an industrial working class. He makes clear that the revolution represented a social form of a natural earthquake, something fundamental, tectonic. The changing role of the Bolshevik (i.e., “majority”) segment of the Social Democratic party, under Lenin’s leadership, is the thread holding the complex narrative together. Le Blanc carefully details the evolving political climate in which a radical Social Democratic left (Bolsheviks and other radicals) competed against moderates (i.e., Mensheviks, the “minority”) as well as centrists and arch-conservatives. However, the country’s economic stagnation only deepened when the czar allied with France and Great Britain in war against Germany. Popular reaction deepened as soldiers joined workers and peasants in opposition to the government. Le Blanc makes clear that the actual Russian Revolution that occurred during the weeks in October/November 1917 was nearly bloodless and nonviolent. The Provisional Government, led by the Mensheviks, collapsed in the face of mass, popular rebellion and the Bolsheviks took state power. The new government moved quickly to end their country’s participation in the war, but radical actions by peasants (e.g., ceasing estates), workers (e.g., taking over factories) and soldiers (e.g., arming oppositions to the old guard) pushed the revolution further to the left. In one of his most revealing chapter, Losing Balance, the author painstakingly details how the ill-fated revolution was undone. The author lets Serge drive home his message: “It is a storm in which no one is spared, which uproots the strongest and which the unforeseen triumphs.” The failed old-guard (i.e., the “Whites”) launched a counter-revolution, assassinations escalated (including an attempt on Lenin) and foreign forces invaded (including from the U.S. and UK). In response, the Bolsheviks imposed rule through a one-party state, mobilized a massive fighting force that defeated both the Whites and the foreign forces, and let loose what is known as the “Red Terror,” with the secret police, the Cheka, killing about 50,000 people between 1918 and ’22. These factors, along with many more that Le Blanc carefully details, set the stage for Stalin’s ascension to power following Lenin death in ’24. 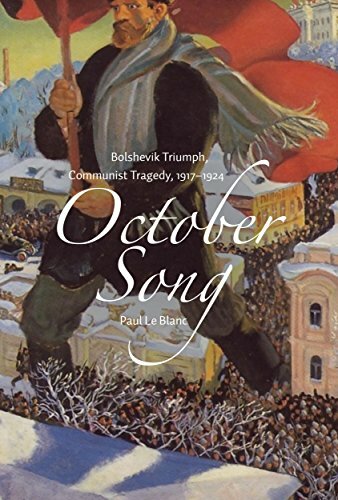 October Song is a scholarly work that carefully tracks the shift in the Russian revolution from “triumph” to “tragedy,” one involving ideology, political alignments, popular movement, world historical figures and, ultimately, and new Stalinist state. While lacking the magnetism of Trotsky, Serge or Reed, Le Blanc’s rigor is impressive, he knows his field and has fashioned a well-reasoned and carefully argued work. He presents a complex view of Russia, one that sets the terms of revolution, of what was possible, within a profoundly shifting historical context. Like the American and French Revolutions, along with the Paris Commune, the substance and complexity of Russian revolution has essentially been lost. But unlike the U.S. and France, today’s Russia of Vladimir Putin and the oligarchs does not hold a national celebration honoring this world-historical event. Le Blanc reminds today’s reader of what’s at stake in a real revolutionary upheaval.